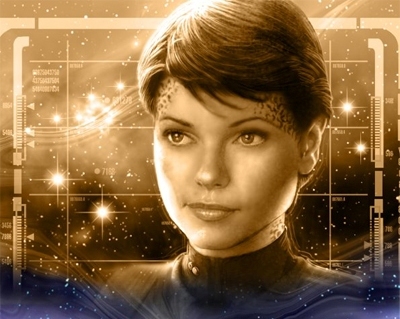 Ezri Dax was a joined female Trill, born as Ezri Tigan on the world of New Sydney in the year 2354. Her mother was a successful mining magnate, and she and Ezri disagreed on many occasions. Her father was often absent – Ezri noted it was because he couldn't bear to be around his wife. Ezri's closest family member was her younger brother, Norvo (who gave her the nickname Zee), while her older brother, Janel, was someone whom she looked up to. Ezri dreamed constantly of ways to escape her family, and eventually managed to do so by joining Starfleet. In 2375, Ezri was an ensign serving as assistant ship's counselor aboard the USS Destiny when it was dispatched to Deep Space 9 on a medical emergency – to carry the Dax symbiont back to Trill following the death of its previous host, Jadzia Dax. En route, the symbiont took a turn for the worse, and, as the only Trill aboard, though one who had decided against joining, Ezri had little choice but to undergo the joining procedure, with only a fifteen minute lecture from the ship's non-Trill surgeon to prepare her. Following the joining, Ezri returned to Trill with the Destiny, and met with members of the Symbiosis Commission's Evaluation Board, who gave her counseling on how to deal with her new memories, but they were unable to help her further. With her friends and family having difficulty adjusting to her changed personality, and her own confusions about who she really was, Ezri took a leave of absence. Seeking some sort of link to the person she was now, Ezri sought out Benjamin Sisko, a friend of Dax's previous two hosts, to see if he could help her through the difficult process of integrating eight lifetimes of experience. At the time, Sisko was searching for the Orb of the Emissary, and Ezri agreed to accompany him, Jake, and Joseph Sisko, to Tyree to find it, noting "it'll be just like old times… except, different". It was while traveling there that Ezri discovered she now suffered from space sickness – warp drive made her 'a little queasy'. Another effect of the joining was a change of dexterity, from right hand to left hand. Despite her rapid mood swings and general insecurity, Ezri was able to help Sisko discover the Orb, and restore the Prophets to the Celestial Temple. At that point, Sisko returned to Deep Space 9, bringing Ezri along with him. She found Jadzia's former colleagues still grieving for her, and was prepared to return to her duties aboard the Destiny, hoping to reduce their pain in seeing her. However, Captain Sisko asked her to remain aboard to work as the station's counselor, with a promotion to lieutenant junior grade, and waived her remaining training. Her first assignment was to attempt to alleviate Elim Garak's claustrophobia. But, when the sessions broke down, and Garak turned on her, the emotional anguish caused her to decide to resign her commission. She quickly changed her mind when she was finally able to diagnose the root of Garak's attacks. Although many of Jadzia's friends and colleagues quickly accepted the presence of a new Dax in their lives, her relationship with Jadzia's widower, Worf, did not go quite as smoothly. Initially, Worf wanted nothing to do with her, considering her presence an affront to his wife's memory. However, he soon realized that his actions were more of an affront, and relations between them began to warm. Ezri played in the Niners baseball team against the Vulcan team, the Logicians, from the USS T'Kumbra as an outfield player in center field. During practice, she damaged her knee trying to make a catch, but recovered enough to play in the game, making an impressive catch using some of Emony's gymnastic skills (Julian Bashir dubbing it a "Fancy Dan"), and taking over from Miles O'Brien as first base coach following Sisko's ejection from the game. Following Dr. Bashir's treatment of Sarina Douglas, Ezri helped her settle in, and supported Bashir when the treatment appeared to have broken down. Sarina noted of Ezri: "The day she realizes that she's more than just the sum of her parts, she's really going to be something." When Kor visited the station, seeking a command in the war, Ezri once again found herself having difficulty separating herself from Dax's previous hosts, wanting to go off with him, fighting side by side. Quark overheard part of her conversation with Kira Nerys over the subject, and misinterpreted it, believing she wanted to pursue a relationship with Worf again. When he confronted her over his objection to such a move, Ezri set the record straight, but considered it one of the kindest and dearest things she'd ever heard. Ezri accompanied the USS Defiant when it resupplied the Starfleet position at AR-558 in the Chin'toka system. While there, she bonded with one of the engineers there, Kellin, and helped come up with the method to expose the "Houdini" subspace mines that littered the planet. When the Defiant was forced to break orbit, Ezri remained on the surface. It was her first experience of conditions on the front lines, and in the brutal Jem'Hadar assault that followed, she acquitted herself well. Following the events at AR-558, Ezri attempted to assist Nog in dealing with the trauma of losing his leg in the attack. However, Nog's post-traumatic stress caused him to seek comfort in the Vic Fontaine program, rejecting other's efforts to help. Despite this, Ezri continued to support him, advising his friends and colleagues to give him time, and giving Vic hints on how to push Nog back towards reality. Shortly thereafter, Ezri returned to New Sydney for the first time in three years, when O'Brien disappeared on the planet while searching for Morica Bilby. She found it difficult to reintegrate herself into her family, and when it was revealed that Norvo had been responsible for Morica's death, blamed herself for not being there for him to help her brother sort himself out before it happened. Ezri got on very well with Hector Ilario, another new officer aboard the station, and, following his murder, she decided to investigate on her own. However, lacking in knowledge of criminalistics, she chose instead to confront Joran, Dax's sixth, and shortest-living, host. Joran's presence in Dax persuaded Ezri to perform the Rite of Emergence, so that he could direct her in finding the killer. The Joran aspect attempted to turn Ezri towards his own mindset, but she was able to resist to some extent, and was relieved to be able to force Joran's memories deep within her subconscious once the killer was caught. When Vic's program triggered a secretly-embedded jack-in-the-box subroutine, Ezri helped in the plan to restore the scenario to normal, working herself into the program as a waitress. Not long after, Ezri encountered Captain Boday, the Gallamite, who had dated Jadzia for a short time. The two shared dinner, something Bashir and Worf disapproved of. Following the destruction of the IKS Koraga, and the disappearance of Worf near the Badlands, Ezri found herself once again struggling to separate herself from the memories of Dax's previous hosts. Seemingly driven by her memories of Jadzia and Worf's relationship, Ezri appropriated a runabout, and set off in search of his escape pod, disobeying direct orders from Captain Sisko in the process. Worf was recovered safely; however, when they attempted to return to Federation territory, the runabout was attacked by two Jem'Hadar fighters, and destroyed in the atmosphere of Goralis. While awaiting rescue, the close quarters and general air of tension between Worf and Ezri led to them sleeping together. This new development in their relationship was cut short, however, when a few hours later, the two were captured by a group of Breen, and taken to a vessel in orbit. During their captivity, Ezri soon realized that Worf was seeking a relationship with her in an attempt to recapture that which he had with Jadzia. Both were subjected to intense mental interrogation, torture and mistreatment during their captivity aboard the Breen warship. When Ezri was returned to their cell following one session, she unknowingly expressed feelings for Julian Bashir, something that surprised even her. However, this admission soured her relationship with Worf yet again – albeit temporarily. The pair were then transported aboard a Jem'Hadar fighter, as negotiations between the Dominion and the Breen Confederacy got underway. Ezri and Worf were taken to Cardassia Prime, where it was intended that they would face trial and execution for war crimes soon after. Knowing how little time they had left, just before they were to be executed, the two were able to reach a final reconciliation over their previous relationship and come to a new understanding – as friends. However, they were able to escape back to Deep Space 9 with the unexpected assistance of Damar, who, having become disillusioned with the Dominion and Cardassia's waning influence in the quadrant, gunned down their Jem'Hadar executioners and told them how to escape Dominion territory, and to let Starfleet know that they had an ally on Cardassia. Ezri and Worf returned to Deep Space 9 as news filtered in of the attack on Earth. Settling back into life on the station, Ezri found it difficult to reconcile her newly-discovered feelings for Bashir with her friendship with the doctor and sought support from Worf as to whether she should disclose her feelings to Bashir. She began avoiding Julian, which led to him confronting her over it. E zri was preparing to tell Bashir when he was called away. The situation was set aside when the Breen launched a counterattack at the Chin'toka system, leading to the Second Battle of Chin'toka, at which Ezri manned the communications console aboard the Defiant. When the vessel was disabled by the Breen energy dampening weapon, Ezri safely evacuated along with the rest of the ship's complement. Following the Defiant crew's safe return, Bashir once again attempted to discover the reason behind Ezri's avoidance, and, once again, Ezri's attempt to disclose her feelings was cut short, this time by Julian's discovery that Odo had become infected with the morphogenic virus affecting the Founders. The confusion led Bashir to believe that Ezri was seeking to restart her relationship with Worf. Ezri later helped Worf determine the correct course of action to take following Gowron's disastrous attempt to take control of the Klingon defense strategy. Considering it a small piece of a larger puzzle, she noted that the Klingon Empire as a whole had become corrupted, and felt that the society was in deep denial about the true nature of their leaders. She discovered that both Worf and Martok had decided to make her a member of the House of Martok – Martok considered her "an honorable woman and a worthy successor to Jadzia". Ezri thought it was very sweet of him. At some point during the year, Ezri had loaned Julian a copy of A Tale of Two Cities that had belonged to Jadzia. It was this book that enabled him to realize that he and Miles O'Brien were trapped inside Luther Sloan's mind. Ezri was the one who discovered the two in an empty science lab after O'Brien missed an appointment to fix her sonic shower. The awkwardness between Ezri and Julian continued, now with both avoiding the other. Finally, they confronted each other and admitted their feelings. Both agreed that their friendship was too important to risk jeopardizing it and decided to remain friends. However, that idea was quickly abandoned, and the two shared their first kiss in a turbolift heading to ops, much to the chagrin of Worf and O'Brien. Ezri and Bashir spent their first night together the day before the new USS Defiant departed to lead the Allied invasion of Cardassia. The two made a pact to come back alive. Ezri once again manned the communications console during the Battle of Cardassia. Following the successful conclusion of the battle, and the end of the war, Ezri encouraged Worf to accept Chancellor Martok's offer of a position as Federation Ambassador to the Empire. Ezri remained on Deep Space 9 following the war. In January of 2376, Ezri brought the legendary Sword of Kahless into the possession of the new Klingon Chancellor, Martok, on the world of Boreth at a pivotal moment of a Klingon civil war. In April of 2376, Dax was onboard the USS Defiant when a surprise attack by the Jem'Hadar killed the ship's new CO, Commander Tiris Jast. Drawing on the memories of Dax's previous hosts, Ezri took command and defeated the attacking Jem'Hadar. The experience made Ezri realize that she was capable of so much more now that she was joined, and made the switch to the Command Track. It also earned her a nomination to receive the Starfleet Citation for Conspicuous Gallantry. April also saw a strain on Dax's relationship with Bashir when she began to explore the connection with her previous hosts and momentarily took on the personality of Jadzia Dax when they were making love. The incident spooked and offended Bashir who stormed out of Dax's quarters. The pair later reconciled after Bashir nearly died. Ezri and Julian traveled to the world of Sindorin to destroy the laboratory of Dr. Ethan Locken, a rogue former agent of Section 31, who was breeding an army of Jem'Hadar Soldiers. Ezri was given the position of first officer aboard the USS Defiant for its three-month exploratory mission of the Gamma Quadrant by the mission's commander, Elias Vaughn. During the Gamma Quadrant mission, Ezri commanded a shuttle mission attempting to protect the Vahni Vahltupali from the debris of their shattered moon (an effort that tragically led to the mission's only casualty, Ensign Gerda Roness), mediated a solution to a caste conflict between the Cheka and Yrythny species, encountered an ancient alien artifact that actually separated her from Dax for a time, and confronted Commander Vaughn when he was letting personal desires get in the way of the mission. Upon her return to the Alpha Quadrant, Ezri found herself in the middle of the Bajoran Parasite crisis. The alien Parasites had a genetic link to the Trill symbionts and had been encountered by a previous Dax host, Audrid. The revelations about the origins of the Parasites brought major civil unrest to the world of Trill when Ezri returned there to testify about the Parasite affair. After a radical faction killed a large percentage of the symbiont population, the Trill President, Lirisse Maz, ordered a moratorium on joining, allowing the symbionts to replenish their population. Ezri and Julian ended their relationship soon after, when Ezri began to believe that his feelings for her were a by-product of his unrequited feelings for Jadzia. In 2377, Ezri attended Starfleet's Advanced Tactical Training on Tellar returning to her post on Deep Space Nine after training. After the destruction of Deep Space Nine Ezri was assigned to Deep Space Nine (II) as Second Officer while maintaining her post as First Officer on USS Defiant. Ezri was a little hurt that Commander Ro was promoted ahead of her after Commander Vaughn's retirement.